Our Suzani pillows are made of fabric that is a modern day version of the antique needlepoint textiles that were originally used for bridal dowrys. Suzanis were said to bring only good things to a marrying couple. Choose a predominantly blue or red suzani motif. You can buy extra fabric for upholstery, curtains, bedding from us too. Our Suzani decorative throw pillows have self piping and zipper. 18� x 18� decorative throw pillows. See our Suzani fabric by the yard. See our ikat pillows too. Our suzani decorative throw pillows are a wonderful gift to newly weds starting fresh or to yourself if you are just refreshing your living room. They are the perfect decorative sofa pillows when you want something a touch different and a bit exotic. 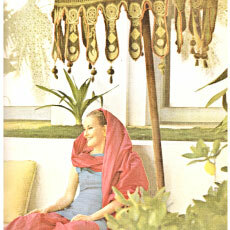 Decorators love interesting suzani pillows. They are constantly popping up in home design magazine in living rooms, family rooms and beds. Suzani or needlepoint is an ancient art. Our suzani pillows are our homage to American philanthropist and art collector Doris Duke. Duke fell in love with Suzanis when she traveled to the East and had a collection of them at Shangri La, her home in Hawaii. Suzanis work in a warm or cool climates. The floral motifs are always cozy and charming. Duke�s collection is being lovingly curated and restored today. The fabrics that our suzani decorative throw pillows are made of are a modern day take on the rare, ancient suzanis Duke collected. They are great looking and affordable for those of us who, unlike Duke, are not heiresses but have good taste. 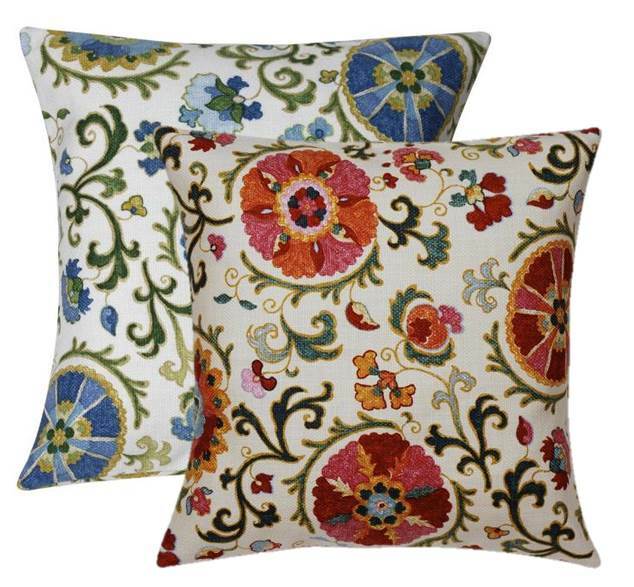 These suzani pillows will wear well and look inviting on your sofa, couch or bed. Pillow covers can be removed for cleaning.